Shiver me timbers and hoist the sails because its time to go on an adventure to find buried treasure. If you can spin these reels just right, you'll find yourself raking in a hefty cash prize! Treasure is your main objective in this pirate themed, classic 3 reel game. If you can spin three chests across the single pay line, you could win the top prize of 2500 coins! There are also plenty of other symbols to help you in this adventure, including the Jolly Roger pirate flag. Spin three of these across the pay line to grab 240 coins. A combination of the flag and chests will also win up to 120 coins. Triple, double, single, or a combination of the three BARS will also help you amass a fortune as all of these symbols carry hefty prizes if you spin them across the reels. Finally, try to get the seashell across the line, as one, two, or three of these shells will get you 6, 15, or 30 coins. Be sure to wager the maximum of 3 coins in order to activate the highest pay table in this swashbuckling adventure. 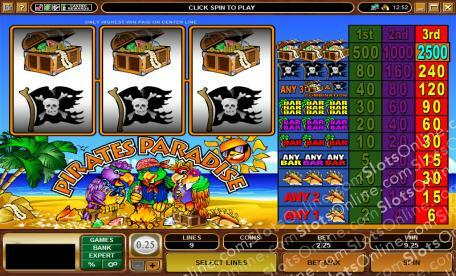 See if you can spin the reels to uncover pirate gold. If you're successful, you might just walk away with plenty of cold hard cash!